Last weekend I was invited to a wedding - an alchemical marriage of the moon and sun no less - at a fascinating chapel in North London. 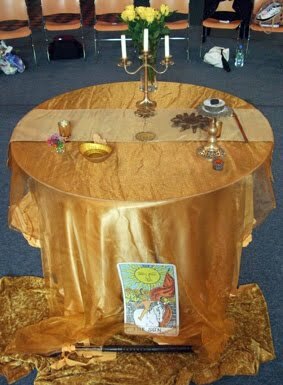 This was an event organised by renowned priestesses Vivianne Crowley, Caroline Robertson and Caroline Wise, and promised to be an experiential day of ritual, discussion, chant, meditation and visualisation. 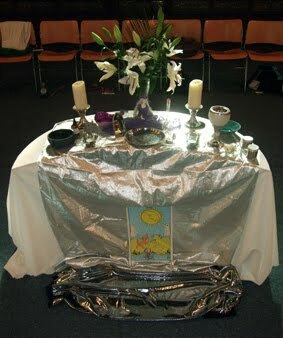 It was the third in a series of three workshops with themes based on alchemy. The first two were Phoenix Rising and The Emerald Tablet. The description of The Alchemical Marriage of the Moon and Sun I'd been sent, along with a beautiful invitation card, said: "The Sacred Marriage of Queen and King, Moon and Sun, is a central image of alchemy in the Western Magickal Tradition. It appears also in the Wiccan third degree and as an image of individuation in the psychology of Carl Jung. "In the spirituality of both West and East, we find a shared vision of the transformation of the personality through a unification of the disparate parts of the Self that is at the same time the unification of Self with Other – other people, the greater cosmos and the Divine." The day began with talks about the history of alchemy and how traditional alchemical methods could be seen as a symbolic representation of methods of personal transformation. The activities continued with meditations, breathing exercises, visualisations and chants to help everyone present experience for themselves the process of synthesis that gives birth to new energy and inspiration. The day ended with a beautiful ritual in honour of the sun and the moon, and their sacred union. You can see the sun and moon altars in the photographs right and left. During the ritual we spiralled around the altars and lit candles to place on them then spent time doing our own personal work in relation to the energy of the sun and moon before sharing cakes and wine. 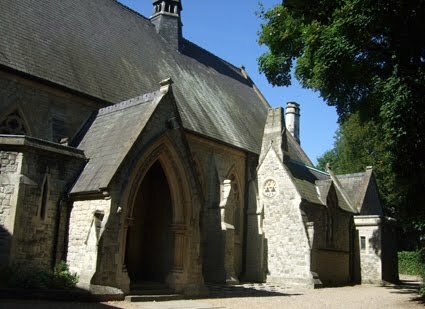 The Alchemical Marriage of the Moon and Sun took place at Rosslyn Hill Unitarian Chapel, in north west London (pictured top). Unitarianism is spirituality without dogma. It welcomes people of all religious faiths as well as those who are humanistic - and it seemed an extremely appropriate venue for the theme of the day. Obviously, a chapel is a perfect place for a wedding, but this is a chapel that embraces both Christianity and paganism, allowing new spiritual consciousness to grow out of a union of traditions that are often seen to be at opposite ends of the religious spectrum. I look forward to seeing what wonderful new things come of this alchemical marriage. Rosslyn Hill Chapel regularly hosts Wheel of the Year ceremonies inspired by pagan traditions - the next one is an Autumn Equinox celebration at 7pm on September 23.
beautiful place to have a wedding such like this.